The 3rd album from Nemesea continues the pattern that they have established on their two first albums, labeled as alternative rock / metal, and this description is true to the bone. How often do you hear German and English language in the same song? Anyway, 14 songs may be one or two too many, but we take it as it comes. 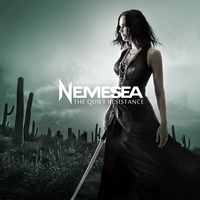 The opener is a short song called The Quiet Resistance, an intro to the album but strangely enough this short title track is of a style that is very different from the other items on the Nemesea shelf, this song is gruesome dark, you have to listen to yourself to get the picture. Afterlife is the next, hard and experimental rock music, worth a listening or two. Whenever is a soft rock song, melodic guitar work, but the surprise comes in the chorus which is very hard rock. Complex? No, just the Nemesea style. Release Me has gigantic sound quality, a pop rock song with hit potential. Stay With Me is symphonic metal where the clear vocals from Manda Ophuis marks the musical style out for Nemesea. Allein is a very tough rock song and here the magic comes: with help from Heli Reissenweber to sing German, a nice hard duet springs forth with Manda and Heli in this English / German thunderstorm. Say continues with hard rock in a way that Swedish pop-rock band Roxette used to do, interesting. High Enough gets on with the harder pop sound with some influence from Canadian band Heart, especially in the way Manda Ophuis controls the vocals. More hard power music comes in I Live, but it has the characteristics of a soft ballad that aims for more power, and achieves it successfully. This is a very interesting album from Nemesea, and only reason for not giving a grade of 9 is that there are too many songs, and the extra material pulls it in the other direction.